On 5 October, UNU-IAS hosted a movie screening of Wastecooking, a 2015 Austrian documentary, to commemorate World Food Day. The event was organized with the aim of providing a platform for the exchange of ideas and viewpoints about the present and future state of food security and consumption patterns. 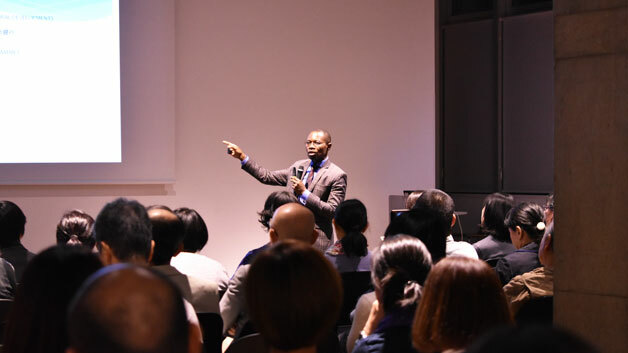 During the first part of the event, Mbuli Charles Boliko, Director of the FAO Liaison Office in Japan, and Akiko Umehara, Director of the Japanese NPO Morinooto, discussed the realities of food waste and offered ideas for its prevention, including easy tips for limiting food waste in the home. After the film, the guest speakers and the participants actively discussed what can currently be done to reduce food waste, the movie’s major message.